More and more people are jumping on the bandwagon and getting an in ground trampoline for their families. All you have heard about them so far are the good points. Now you wonder if you should follow the crowd. Before you leap, you should look at the whole story first. This article will tell you about those hidden problems that come with installing an in ground trampoline in your back yard. #1. How big of a hole do I need? It is quite easy to get caught up in all the good [points that come with in ground trampolines. The safety factor alone makes it worth considering installing one in your back yard. But before you make your decision to join others on the in ground trampoline bandwagon, there are some facts you need to know. There are some problems that you need to overcome before you can use your new in ground trampoline and bounce your way to a healthier lifestyle. This is a major problem because it contains 2 factors that can influence your trampoline use. First, if you dig the hole a little shallower than your trampoline height, you are creating a tripping issue. If someone in your family doesn’t pick up their feet entering or exiting the trampoline, they can fall and hurt themselves. Or someone else walking in your back yard could miss the hole and trip over it causing you other problems. The second problem that comes with digging your new hole is that if you make the hole flush with the trampoline top, you may not get the ventilation you need. A lack of ventilation affects the bounce of the trampoline. Your fun and exercise time will be cut down due to the lack of ventilation. This can be costly because you will need a strong barrier between your new hole and the rest of the dirt surrounding it. The last thing you will need is a cave in if you get lots of rain. Your toughest choice here is deciding which materials you should use to make sure you have a strong retaining wall. A concrete or a cinder block retaining wall is the strongest to use but your ground may not have a lot of pressure on it and you could get by with lesser and less expensive materials. A solution to this issue wold be to have n experienced contractor come out and evaluate your lawn area and see which material is best for you. When this happens, you run the risk of allowing rust and corrosion ruin your trampoline frame. Also, the lack of proper drainage will undermine your trampoline’s foundation. This may cause your trampoline to become uneven. Of course, the type of retaining wall you have decided to use will influence the style of your drainage system you use. The solution here can be perforated drain pipes leading to gutter or storm drain. Again, you should ask the opinion of the experience contractor who comes out to evaluate your lawn for your retaining wall. There will always be some situation that arises that requires you to lift up your trampoline. It is inevitable that one of your kids or their friends will lose a shoe or throw something underneath the in ground trampoline. The only way to get those items out from underneath the trampoline is to lift it up. Or you may need to do some maintenance work on the frame, retaining wall or drainage. These chores also require you to lift up your trampoline and get the work done. The solution to these issues is to make sure you have a little room to lift and then lower your trampoline without causing any damage to you, your helpers, the retaining wall and your trampoline. The hole you dig should be at least 1 foot wider than your in ground trampoline. This is an issue that needs the right attention. If you do not have the right ventilation system, then the air underneath the trampoline cannot go in and out to help your bounce. Without the proper air flow, you place a lot of pressure on your trampoline frame as well as the user’s joints. Or you can use trampoline safety pads that cover the gap while allowing air to ventilate properly. Your garden - you may have to do a little landscaping when you put in your new in ground trampoline,. This may mean moving your treasured garden to another location. Because nothing is perfect in this world, even in ground trampolines have their good points and their faults. In ground trampolines would not be considered normal if they didn’t. As with any topic, people always want to know which is better. This is a legitimate curiosity because normal; people like to get the best product for themselves and their families. When it comes to trampolines, getting the best option may also be the safest option to choose. Here is a little comparison to help you decide which is the best model of trampoline for you and your family. We may duplicate some points on the in ground trampoline but that cannot be helped. No real installation costs - just set it up and you are ready to go. It can be a toss up when comparing which trampoline style is better than the other. We favor the in ground one because it makes the trampoline a lot safer. It is also not an eye sore. You have creative options available that do not exist for the above ground trampoline. The real issue for us is the cost. It just may cost too much to install an in ground trampoline. For that, you just have to check your budget, get good estimates and then make your decision. 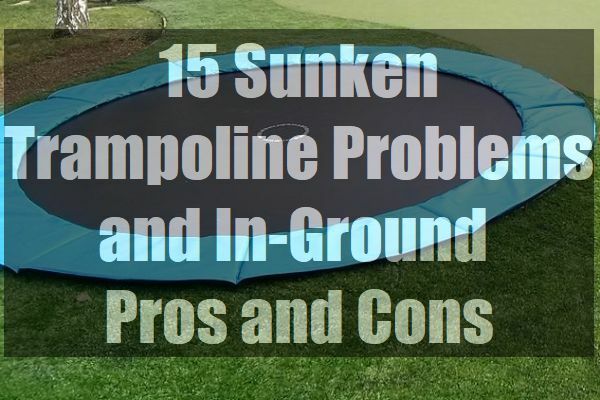 The 5 most common problems that come with an in ground trampoline are to be expected. They are about the same issues as any other construction project that requires you to dig a hole. The minor issues you can address when they arise or take the proper steps as you go. They are not really deal breakers because they are apart of any project. You also have minor issues arising when you have an above ground trampoline. Even after examining the pros and cons, they seem pretty close. No item is going to come with perfect conditions. It all depends on which ones you want to live with. The key question will be, can you afford the in ground trampoline? You will get the same benefits from both styles and the same safety equipment., It will all depend on your preference and your budget.